I regularly stroll through the internet and look for items of Hodgsonian interest. Occasionally, I find a few things. Here’s a couple I found today. The ComicVine website records a previously unknown to me appearance by Hodgson in a comic called CTHULHU #1 which was released in 2010. 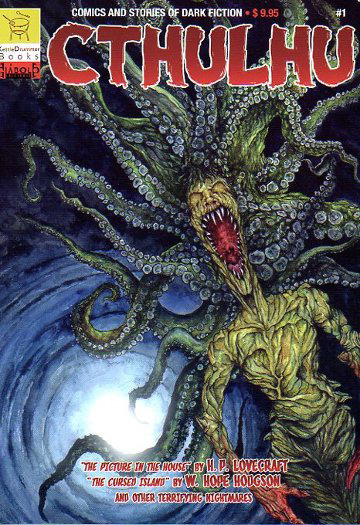 I do not have a copy of this comic but the listing states that the story, “The Cursed Island” is by WHH. This may be an adaptation of “Voice in the Night” but, if anyone could supply more information, it would be appreciated. S.T. Joshi informs me that the Hodgson volume of the Centipede Press Library of Weird Fiction should be available soon. This will be a 900 page collection of Hodgson’s works and is a bargain at the publication price of $60. Other volumes will include Lovecraft and Blackwood as well.